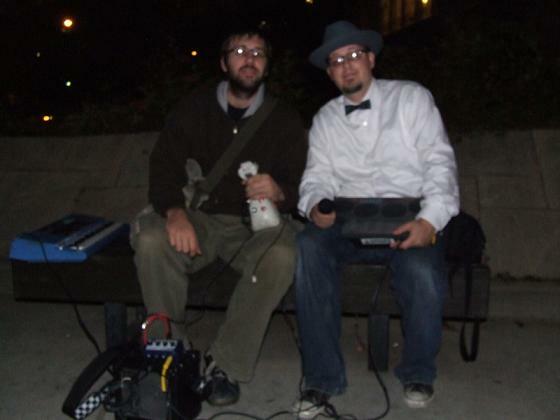 Madison Wisconsin was witness to it’s first ever Circuit Bent Parade this past Halloween night. A gathering of experimental artists, whom all were circuit benders, paraded up and down Madison’s State Street, while crazy drugged out revelers looked on in pure confused form. One on-looker asked participant Igloo Martian “what are you together” as she tried to guess what inconceivable idea, from some inconceivable cult flick costume we were trying to replicate. Igloo simply said ” oh…were not together”. This set the mood thoroughly for a perfect night, as both the woman with question and Igloo broke out in laughter. You see, it was Halloween night. Nothing was supposed to make sense to those who gathered on the same street to be entertained by one’s own, or others, crazy filled minds. This was Madison’s night to let the freak out! The parade launched right at 9pm from Madison’s Memorial Union’s steps. The line consisted of Igloo Martian, and myself (life as number five.) We were later, our first trip down State Street, stopped by Frenanda (Useless Unknown Facts), a speak and spell toting, fashionable appropriate Image of The Life Aquatic with Steve Zissou. Neither Igloo or I had ever met her, so it was a pleasant surprise to meet another bender at such a cool time. Igloo offered to plug Frenanda into his traveling amp, which he already had the both of us mixed to grove. After plugging Frenanda in we were set to jam, marching to the beat and sounds of an obscure circus parade from some twisted 40’s animated picture show. Weaving our way in and out of the crowd of 1000’s that gathered, we were subject to many bizarre characters and situations, all in great fun, even the police…at one point. One man commented that “this was the best thing I’ve seen on State Street in a long time”, this was a true compliment as State Street is famous for the odd and unusual. After a few hours of continuous experimental jamming, we called it quits for the night, all leaving satisfied. Having had spontaneous dancers and cross dressing males burst out into tribal stride, we knew we had ripped it up as thoroughly as we could have ever dreamed. Not many pictures were taken, as we were to into the parade to care, and as those we asked to snap a picture were to drunk to even understand our request to snap a photo of us as we played. So I’ll leave you with the images your own thoughts can conjure of such a mighty event, and recommend you have a Circuit Bent Parade of your own in the near future. Maybe New Years Eve….